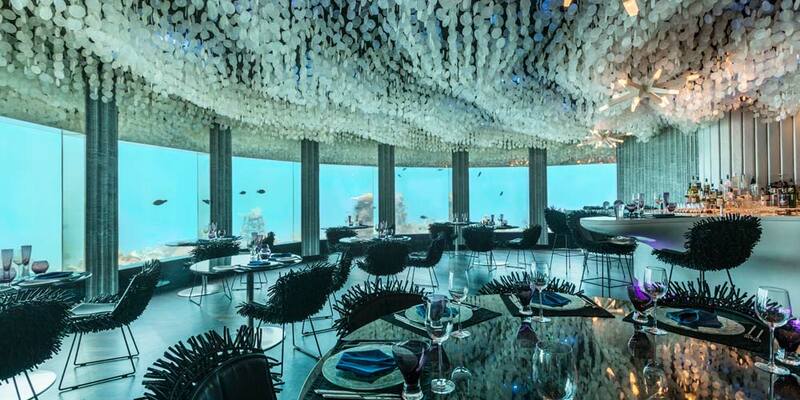 Fancy dining beneath the waves? 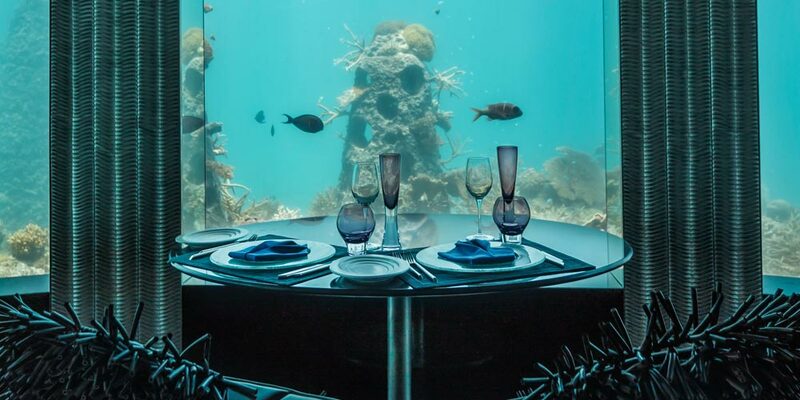 Following rave reviews of its world-first underwater nightclub, Subsix, PER AQUUM has evolved the pioneering venue into an underwater playground, a creative space which can be transformed into whatever guests imagine it to be – from private Champagne breakfasts to lunchtime celebrations to midnight proposals. Located at PER AQUUM Niyama in the Maldives, Subsix first opened in 2012. Guests reach Subsix via speedboat, skipping over the reef to its 500-metre offshore location. Upon arrival, the underwater revellers descend a dramatic three-tier staircase. In the centre of the room, a huge clam-inspired bar strikes an imposing form. In addition to the seating in the clam’s swooping curves, tables and chairs dot the space, with the most coveted seats by the floor-to-ceiling glass windows. Over 90 coral reef species ply the waters, the dense marine life being attracted by the specially designed reef structures that integrate into the natural reef and enrich the habitat with surfaces for coral and hiding spots for the more reclusive denizens. Parrotfish swim past shoals of Moorish Idols. Moray eels slide through the lagoon. Groupers make appearances amidst the rainbow of butterflyfish and damselfish, while the resident Hawksbill turtle makes occasional visits at the cleaning station. Among the many activities hosted by Subsix, marine biologist-led immersions into aquatic life give guests an expert’s insight into the rich environment and its secrets. Other highlighted activities in the restyled venue include subaquatic lunches, gourmet dinners, weddings, hosted events and wine tastings.